We recently wrote about how you can beat the Instagram Algorithm without actually cheating. The main reason that Instagram changed its algorithm was that it is now so popular that most users cannot look at every post in their feed. Indeed, the average user misses about 70% of the posts in their Instagram feed. Another advantage that Instagram has over the older social networks is that it is inherently visual. Sure, you can post pictures and videos on Facebook and include them in your tweets on Twitter – but these were added as an afterthought. Instagram was built around sharing images. The visual nature of Instagram makes it a natural fit for influencer marketing. 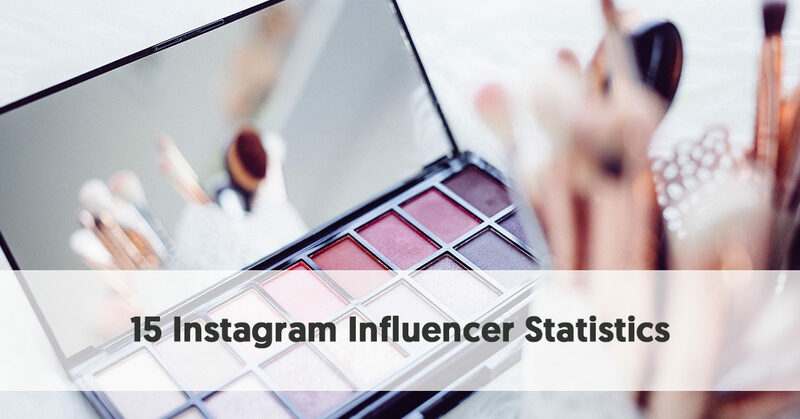 So, it comes as no surprise when you look at the statistics to see how well influencer marketing and Instagram go together. Instagram's usage is increasing at a rapid rate. Its user numbers have doubled over the last two years, and are more than five times what they were four years ago. Instagram began in 2010. It reached 100 million active users in February 2013 - a number that people considered excellent at the time. 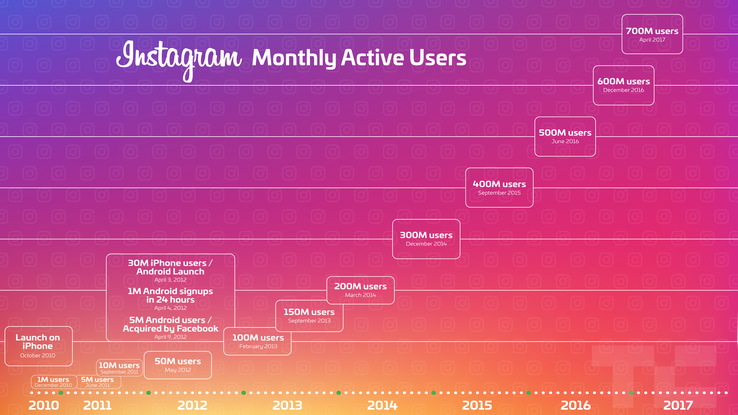 In March 2014, Instagram usage reach 200 million users. They reached 300 million users in December 2014, 400 million in September 2015, 500 million in June 2016, 600 million in December 2016, 700 million in April 2017, and now 800 million in September 2017. While this still pales beside Facebook’s 2 billion users, it is more than double Twitter’s 328 million. Of the 800 million Instagram users, 500 million user their account on a daily basis. This statistic shows a huge change during 2017. There were only 150 million daily users in January 2017, rising to 200 million in April and skyrocketing to 500 million in September. According to demographic data collected by Pew Research in 2016 nearly a third of wealthy Americans use Instagram. With the rapid increase in Instagram users over 2017, these figures are likely to be higher now. If your product targets a poorer demographic, the figures are even better. It makes sense that Instagram usage is at its highest for the poorest group. The age group with the highest Instagram usage is 18-29 year-olds (59% of this age range operate an Instagram account). Many of these people are students in high school and college, and people who are beginning their working lives. They may not have the highest incomes yet, but they are probably the group most likely to spend on items promoted by online influencers. This is another statistic that indicates how quickly Instagram usage is growing. In 2013, 11.5% of US companies used Instagram for marketing. This rose to 18.4% in 2014, 32.3% in 2015 and 48.8% in 2016. In 2017 this statistic jumped to 70.7%, leapfrogging over the percentage using Twitter (67.2% in 2017). The release of Instagram Business Profiles in May 2016 helped speed up this process. There are currently 8 million Instagram Business Profiles. With such a huge increase in Instagram usage, it was inevitable that spending on influencers would increase as well. Mediakix undertook a study predicting that businesses would spend $1.07 billion on influencer marketing in 2017. This would rise to $1.6 billion in 2018 and $2.38 billion in 2019. Mediakix expects total influencer marketing spending to be $5 – $10 billion by 2020. They made this prediction 2015 before Instagram's support took off, so spending may grow even more than this. Recent results from a Hashoff survey suggest Instagram may end up receiving an even higher proportion of influencer spending. Of the 300 respondents to this survey, 79.7% consider Instagram their #1 platform, and this figure is expected to rise to 87.1% by 2019. Interestingly, only 2.5% of the respondents expect Facebook to be their #1 platform by 2019. Most considered YouTube to be the second most important influencer platform. Mediakix has tried to calculate the number of sponsored posts on Instagram. These are posts that include the label #ad, #sponsored, #spon or #sp. By Mediakix’s calculations, there were 9.7 million in 2016. Based on their expected use of Instagram, they predict that there will be 14.5 million sponsored posts in 2017, 21.7 million in 2018, and 32.3 million in 2019. Posts that use location tagging receive 79% higher engagement than posts that don’t. Allowing for the fact that location tagging is still uncommon on Instagram, brands and influencers could enjoy using this as a point of difference. Selena Gomez has probably the most unbalanced Follower: Following Ratio on social media – 128 million: 284, i.e. she has 450,704 followers for every person she follows. Of course, she is very much a celebrity – and any business that wishes to work with her has to pay celebrity rates. According to HopperHQ, she receives an average of $550,000 for every sponsored post she makes. Huda Kattan is the top of the “normal” influencers. With 21.7 million followers to her Instagram beauty account you would consider her more of a macro-influencer than a micro-influencer. Although the $18,000 she receives per post is well below celebrity levels, it will still be outside the budget for many firms wishing to work with influencers. There is a wide range of payments made to Instagram influencers. In some cases where small businesses work with micro- influencers, there may be little, if any, payment. Often the only payment is when a business provides free product for an Instagrammer to try out. Of course, the majority of influencers are micro-influencers. Brands typically pay them about $50 per Instagram posting. So, who earns $1 million per post? Despite “only” having 107 million followers (compared to Selena Gomez’s 128 million) Beyoncé can bring in $1 million for a sponsored post. Not a bad for a few minutes’ work! Using Socialblade’s Top 50 Instagram Users by Followers you can calculate a gigantic 3.1 billion following for the top 50 Instagram accounts combined. While not all these accounts will be amenable to working with influencers (the top account, for instance, is Instagram itself) it shows the potential reach for brands with deep pockets. Of course, most of these people charge serious sums of money for sponsored posts, but their reach is phenomenal, should their demographic of followers match a brand’s target audience. According to Mediakix the Top 20 Fitness Influencers on Instagram have a combined following of 90 million followers. This was in April 2017, and that number has since risen to almost 100 million. There has been a change at the top since then. At that point, the Instagram fitness influencer with the top following was @JenSelter with 11.1 million followers, followed by @Michelle_Lewin with 10.4 million followers. By September 2017 the top positions had reversed, with Michelle Lewin now commanding 12.6 million followers, compared to Jan Slater's 11.5 million. Forbes has created Top Influencers lists in some categories. One of these is Beauty. Their Top 10 Beauty Influencers combined had 49,157,110 Instagram followers at the time Forbes wrote this article. As at October 2017, their collective following had risen to 57,481,000. Probably the best known of these influencers is Zoe Sugg, aka Zoella. But she has built her influential fame more on YouTube. She “only” has 11.2 million followers on Instagram, compared to Huda Kattan’s 21.7 million followers. The Influencer Marketing Hub commissioned a survey on The Rise of Influencer Marketing earlier this year. We discovered that the average Instagram influencer in the beauty sector has 105,300 followers. Instagram surveys and collects statistics about the platform's use. They have discovered that 60% of people say that they learn about a product or service on Instagram. Instagram clearly works for those at the early stages of the sales funnel. Businesses and influencers use it to educate the public about products and services. According to a ComScore 2016 Instagram survey, 75% of Instagram users take some action, for example visiting a website, searching, shopping or telling a friend, due to being inspired by a post. One of the key findings of a Simply Measured Instagram Study is that posts with at least one hashtag see an average of 12.6% more engagement. They also found that 91% of posts by top brands use seven or fewer hashtags, with 88% of brand posts using at least one hashtag. Although recent tweaks to the Instagram Algorithm has meant that posts are no longer presented chronologically on Instagram, there are still preferred times to make Instagram posts. CoSchedule has studied this at length in What 20 Studies Say About The Best Times To Post On Social Media. They factored in studies form Quick Sprout, Elle & Co, Huffington Post, TrackMaven, MarketingProfs, Later, and their own CoSchedule data. While the different studies provided conflicting suggestions, they showed that Instagram audiences were more engaged during the week. The best times to post were 8-9 a.m., 2 a.m. and 5 p.m. The worst time is 3-4p.m. Mondays and Thursdays are considered the most effective days to post on Instagram. Instagram introduced Instagram Stories in August 2016. In many ways, this is their direct competitor to Snapchat. It has only taken a year for the volume of Instagram Stories to surpass Snapchat messages. Instagram Stories now receives 250 million daily users compared to Snapchat which only has 166 million. Half of all businesses on Instagram produced a story in the last month. Instagram users under 25 boosted their average daily Instagram Story usage to 32 minutes while the Over 25s average 24 minutes per day.